In ‘How to develop value propositions’ we learned how to analyse what we have for our customers and the envisaged benefits for different decision-makers and influencers. This documents the ‘theory’ of why our customers should buy from us, whereas our sales propositions translate the theory into practice. A simple equation tells us that the features of our product / service that deliver advantages factored by the customer’s needs and wants equal benefits. We could have a long list of features and advantages but with no needs and wants, the equation amounts to zero benefit. The variable a salesperson therefore needs to work on is the definition of customer needs and wants in relation to the previously analysed value propositions. This simple fact is often missed by selling operations and misguided marketing departments who believe that value propositions should be pitched via laptop presentations and alike without paying due attention to the need / want definition that should precede it. As someone once said: “Presenting is not selling”. So, how do we make our value propositions bite? Laptop weighs 1kg Salesperson: easy to carry, no back pain Demo How heavy is your current laptop and what strain does it put on your back? Laptop weighs 1kg Finance Director: minimizes back injuries, no litigation problems Case study What is the risk of employment health and safety litigation as a result of back injury claims? Once this ‘gutty’ but productive task is complete, the information should be stored either via hard copy or electronically on your Intranet to enable easy access for active use by all sales functions. This information is then used as the basis of a pre-call plan to define the broad open question that should be asked and the anticipated progressive questions. During the call, progressive questions need to be pitched at the right level. Questions that are too progressive (i.e. too tightly linked to the need / want you are trying to define) may lead to a defensive response from the customer. Likewise, you might narrow the field of information too early in the process. 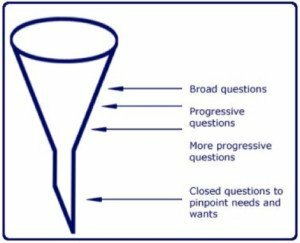 Think of the question structure as a funnel. Sales proposition analysis does not amount to ‘selling by numbers’. Inter-personal skills, careful listening, empathy and note-taking need to be applied to make sure we ask the appropriate questions at the right time. To make sure we apply sales propositions effectively, the positioning of the meeting with each decision-maker / influencer is vital. The more effective the positioning, the easier it will be for the customer to admit needs and wants for your offering. Our ‘thumbnail sketch’ and ‘motivator’ are particularly important to ‘oil the wheels’ of the meeting. In summary, having worked hard to define our value propositions it is essential to equip the sales team with the tools to convert them into sales propositions for each customer. Careful consideration needs to be given to the needs and wants of each decision-maker / influencer so that appropriate questions can be planned to expose them. A comprehensive global database of sales propositions can be drawn up for salespeople to use for customer-specific pre-call plans and for shaping each meeting to gain customer commitment.